Even if you plan to leave early, there is a greater chance that your home will survive if you have undertaken preparations. For more information read the How buildings burn fact sheet. Fitting metal fly wire mesh or solid screens to spark proof the windows, doors, ventilators and skylights. Close in all openings in eaves and under-floor areas. Sealing all gaps in the roof area along the ridge cap, gutter line and fascia board. Extending wall cladding on buildings and sheds to the ground. Sealing the flute spaces at the fascia board with fibreglass insulation or scribed flat metal with corrugated iron roofs. Tiled roofs require an appropriate fire rated insulation (sarking) immediately below the tiles. Most homes ignite when sparks or burning embers blow under tiles and start burning roofing timbers or accumulated litter. Metal roofing offers more protection provided it is firmly secured and sealed around vents, skylights, fascias and roof caps. Underfloor areas that are not enclosed allow sparks and embers to penetrate. If these areas are used to store timber, firewood, or other flammable materials, the risk is increased. Make sure that underfloor areas are kept clear of flammable material during summer. Crevices where embers can collect are potential ignition points. Cracks under doors, on window ledges, windows, or along verandas are particularly vulnerable. Vents into the house structure are also common entry points for sparks. They should be covered in fine wire mesh to prevent embers from getting into walls, roof cavity areas or through windows. Reducing the amount of vegetation on a property is one of the most critical components of preparing for bushfires. Remove dead branches, leaves and undergrowth from around your home especially under trees. Prune tree limbs that are lower than two metres above the ground or overhanging your home. Reduce, remove and manage vegetation such as long grass within 20 metres of your home and within 5 metres of any sheds and garages. Remove bark, heavy mulch, wood piles and any other flammable materials close to your home and sheds. Installing a sprinkler system to wet down your home and garden to reduce the impact of radiant heat, sparks and embers. All fittings should be metal, as plastic melts. Ensuring access to an independent water supply such as a tank, dam or swimming pool of at least 5000 litres. Do not rely on mains water being available during a fire. Installing a petrol/diesel-driven water pump. Making sure hoses are long enough to reach around your home. Using a stone wall, earth barrier, or fence close to your home as a radiant heat shield. Planting lower flammability vegetation, including plants and trees with low oil and high water and salt content. Developing a well-managed vegetable garden, as it can act as an excellent fuel break. Planting trees and shrubs with space between them so they do not form a continuous canopy. 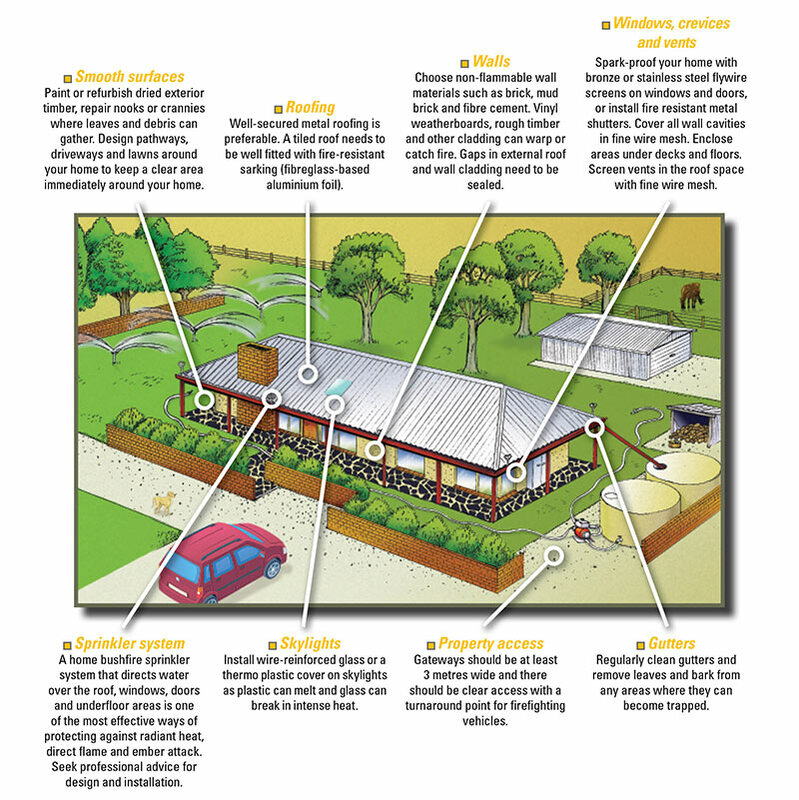 You can do some things in each season to make sure you keep your home and property prepared. In winter take advantage of the cooler weather to clean up your property and ember proof your home. Clear all gutters and create as much clear space as possible around your home. Remove dead vegetation from around your home and prune lower limbs of trees. Ember-proof your home: seal gaps and areas under your home, verandahs or balconies; repair any loose tiles or gaps in your roof; cover windows, crevices and vents with fine wire mesh or flywire; repair or fill nooks and crannies where leaves or embers could gather. Slash or mow long grass and remove cut material (unless it can rot down before summer). Cut back trees overhanging your home. Remove fallen branches and other debris. Check and service all mechanical equipment, including grass cutters, water pumps, sprinkler systems and fire extinguishers. Prepare / check your emergency kit. Review, update and practise your Bushfire Survival Plan. Maintain defendable space of up to 20 metres around your home (greater if on a slope) and 5 metres from sheds and garages. Slash stubble near sheds and buildings (following regulations for Total Fire Ban Days). Practise your Bushfire Survival Plan with your family. Ensure you have a portable battery-powered radio and spare batteries to listen to bushfire warnings. Remove undergrowth and dead vegetation. Check with your council to see if a permit is required for a burnoff. Check for any fire hazards and remove.